"Kafka," said our doctor, checking for existential and inguinal strains. We were in satisfactory shape, he observed, which is more than one can say about Dell or Hewlett-Packard. Dell's eponymous chief Michael is straining in vain to lift sales and profits; the way things are going he could end up with a financial hernia. Meg Whitman, HP's boss, has similar difficulties; she might suffer a fiscal hisnia. I'm probably late pointing this out, because this very topic became the cover of the October 20 Barron's magazine, and usually cautious Barron's is more often a coincident reporter or a laggard than a leader. In the view of investors, Dell and HP have long since hit the skids. Dell shares are selling for about $9.30, giving the company a market capitalization of about $16 billion. During the past year, Dell's shares were worth nearly twice as much, $18.36 apiece, and the lowest they've dipped is $9.21, which is unpleasantly close to the place they are now sitting. HP shares trade for about $14.25, producing a market cap of $28 billion. HP shares during the past year have gone as high as $30 and as low as $14. The Barron's article was written by the magazine's technology editor, Tiernan Ray, who says the shift away from PCs to tablets and smartphones is "inexorable." Among the sources he cites to support his position is IDC, which says PC unit sales will sag by about 2 percent this year while revenue will drop 5 to 6 percent. By contrast, smartphone sales, already huge, will grow 42 percent this year and tablet sales, still far smaller, will jump 65 percent. Ray's words wound not only the two big American PC suppliers, Dell and HP, but the suppliers they (and their rivals around the world) turn to for the chips and software that define the PC experience: Intel and Microsoft, respectively. (Advanced Micro Devices, which also supplies PC chips, is in a boat similar to Intel's, but it's a dingy compared to Intel's supertanker. Cash issues and other factors make AMD's position even more concerning to financial observers than Intel's, but AMD's near-term prospects, whatever they may be, have little bearing on the larger picture.) Ray rubs salt into the wounds he inflicts by quoting an analyst who once worked at DEC, which Ray characterizes as a temporary titan that was eaten by Compaq that was eaten by HP. The analyst reminded Ray that DEC's founder and ultimately its executioner, Ken Olson, once believed hardly anyone would want a home computer. Ray thinks the prospects for Dell and HP in the PC business are reminiscent of DEC's after the proprietary minicomputer market had peaked and before the PC business became the realm of industrial giants. In the article, Ray doesn't point out that HP, too, was one of the minicomputer companies and that HP was adept enough to not merely survive but to evolve into a diversified computer manufacturer that is comparable in size to IBM. Dell is a much younger company than HP and its founder is still its boss, so the dismal comparisons to DEC, run and run into the ground by Olson, might seem to have more substance. by the haunting look of Franz Kafka? Whether or not Dell is using DEC's poison playbook, it really is under duress right now. And so is HP. Perhaps for the wrong reasons, or for only some of the right ones, Ray has managed to arrive at a conclusion that, unfortunately, seems hard to deny. But Ray's reasoning might not be all that helpful to computing executives trying to adjust their strategies in a world where the hardware heroes have been so severely wounded. Computer buyers might be wise to heed Ray and pay a bit more attention to plans that depend in part on thriving vendors willing and able to support their products for years. Those hardware vendors, aided and abetted by a Microsoft desperate to propel Windows 8 into the marketplace, might cynically decide to churn their way to increased sales volumes. As seasoned computer buyers know, vendors always label as progress their attempts to herd customers who have challenges of their own and plenty of reasons to take a wait-and-see approach to Windows 8, just in case it turns out to be Vista. But simply tapping on the brakes might not be enough. That's why I thought this might be a good time to look at things from a completely different perspective, that of the Samsa family. Gregor Samsa, his sister Gerte, and their parents, who share an apartment, are the principal characters in The Metamorphosis, a story published in 1915 by the imaginative Czech writer Franz Kafka. One day, Gregor wakes up to find that he has been transformed into a large bug. The story doesn't say precisely what kind of insect Gregor has become. In the original German, Kafka uses a pejorative term for the bug, a word that generally translates as vermin. The transformed Gregor Samsa can no longer make himself understood by humans, but he can hear and understand what they say about him. His family is generally horrified, although his kind-hearted sister brings him food and tries to adjust things in his room to make the formerly human Gregor more comfortable. Gregor, who had worked as a traveling salesman, can no longer go to work, of course, but his family rearranges their household and takes in boarders to supplement income brought in by Gregor's working father. Gregor is generally confined to his room but emerges in one key turn of the plot to listen to his sister playing the violin for the family's lodgers. This emergence leads to tragedy when Gregor frightens the lodgers and is chased back to his room by a furious father, who makes it clear that he no longer loves his son and in fact wishes Gregor would just disappear. Tiernan Ray seems to expect Dell and HP to adjust to the loss or at least diminution of their massive PC markets, most likely by concentrating on servers. They may not actually have much choice. According to the writer and the experts on which he relies, the PC business has permanently given way to a world in which tablets and smartphones made by companies other than Dell and HP are the most popular client devices. (Ray presents data showing how smartphone unit sales volume has grown to more than double that of the PC. 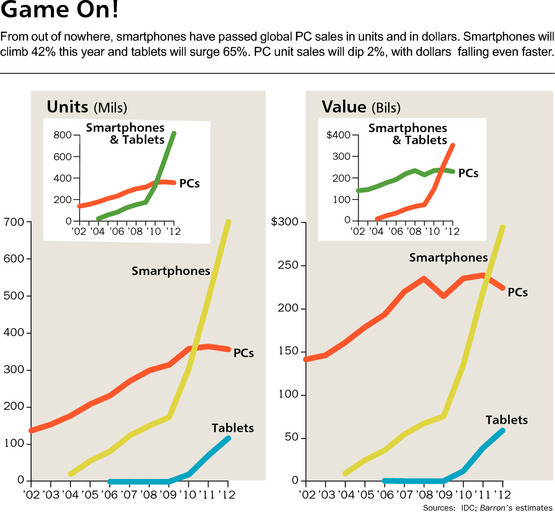 Tablet sales in unit terms are still only about a third of the PC's, but the tablet numbers are rising quickly.) The other big new opportunity in computing, for which Dell and HP may be confined to providing equipment, is cloud computing. In a table accompanying his article, Ray cites companies including Amazon, Google, Facebook, Salesforce.com, and others as current leaders providing (and, in some cases, also exploiting) in cloud services. Apple and Samsung, plus possibly Microsoft, seem to be on top when it comes to mobile client devices. But the emerging world of clouds and compact clients is young, as was Franz Kafka when he wrote his stories and novels and even when he died, aged 40, of tuberculosis. But Kafka, like the jackdaw whose name he bore--although he wrote in German, the kafka is the Czech name for the crow's cousin--gathered the shiniest ideas of early twentieth century Europe, ideas that gave birth to existentialism in philosophy and a number of related developments in literature, music and art. During the next few years Ray expects the computing industries to change quite dramatically. He is too wise to make specific predictions, but he does think the trends he observes will continue and that the permanent dip in the PC industry will very likely lead to number of mergers and acquisitions in a wave of consolidation. He doesn't expect Dell or HP to turn somehow become leaders in the portable client segment. In Ray's dark portrait, Dell and HP contemplating the PC business each resemble the Samsa family as it realizes their son Gregor has permanently changed not merely beyond recognition but outside the bounds of their care and tolerance. When Father Samsa makes it clear just how he feels about Gregor, the son who became vermin is completely heartbroken. Gregor's last act in relation to his family is to die. The Samsas don't even arrange a funeral. Their housemaid manages to dispose of Gregor's corpse. Afterward, the Samsas adjust to all the changes that have resulted from Gregor's metamorphosis. They get a new home. They set off to build new lives for themselves and particularly for Grete, whom they realize, as they contemplate the future, is a very marriageable young lady. Who will merge with Dell? Who with HP?